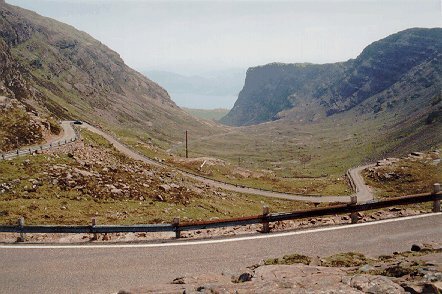 The road from Tornapress (on the A896, north of Kyle of Lochalsh) to Applecross is most dramatic, with steep gradients up to 20% and hairpin turns like those in the Alps. The road passes the infamous Bealach-na-Ba or 'Cattle Pass', at a height of 629 metres. At a hill stands a TV-tower and a walk of about 30 minutes along a not-too-bad path leads to it (a climb of 155 m), and from there one has spactacular views all around. The road with hairpin turns leading to Bealach-na-Ba. 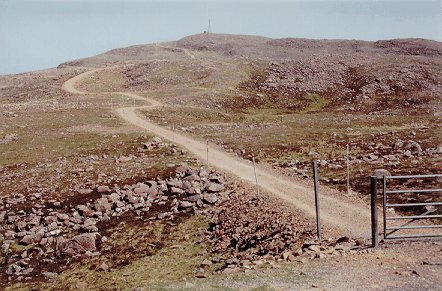 Sgurr Achaoracahin (774 m), with a path leading to a TV-tower. One of the views at the foot of the TV-tower, with some people at the top-right of the picture, showing the enormous scale of the view. 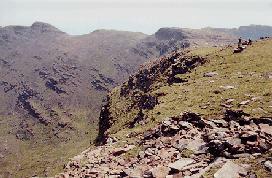 This map (17 kb) shows a red square where these three photos were taken; date: 30 May 1997.